Today I went on Webosaurs’ Facebook page, and I saw there was a new avatar!! WITH SPIKE!! CHECK IT OUT! Spike looks AWESOME in this picture! And Pterry is going right in to Spike’s mouth!! Team Spike forever! I really think Team Spike is pure awesome. What do you think? 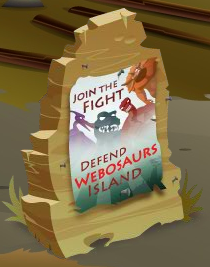 The Defend Webosaurs Island Poster from last weekends Horns Rally is finally here. You can find it in your cave if you went to the party. It looks nice, but I like the Spike Poster is much better. Which do you think is better? Horn’s Message to Team Webo! Horns came to tell us a message. That message was hard to get, since there was WAY too much lag. Nonetheless, we got the messages. Well, there you have it. They’re “busy” planning. I think that they’re really the evil ones, since they’ve trapped the poor eel! We at Webosaurs Cheats do not believe in this, and encourage everyone to join the DETE. (the Dinosaurs for the Ethical Treatment of Eels) We also believe Horns, and Team Webo, will fail horribly. SPIKE FOREVER!! !